There was a time when I was a fearless hunter. I mean, club swinging cave-woman to the core. At least, that’s what I was in my mind. Until I took the proper hunter safety classes at Cabelas and an entirely new view of the gaming field unfolded before my youthful eyes. A view of wild creatures who possess x-ray vision and can smell fear 5 miles away, and of whole armies of hunters tumbling out of tree stands to their death or being speared by razor-sharp arrows or shooting themselves in the leg while trying to scale a fence. Our instructor had sinewy arms and a sack full of horror stories. He made a very distinct impression on my young mind. It was a rather scaring impression, to be honest. My first target-shooting session sounded something like this. I can’t really say that the training made me into the fearless cave-woman hunter that I had been in my mind. But, I did get a big deer at 200-some yards the first day of hunting season. And I did give myself a nice scar by my left eyebrow. It was the beginning of January, and I still had tags to fill. Chunky flakes of snow fell gently to cover the earth’s flaws. It was a cold, crisp, grey sort of day and I’d just finished my normal 6:30 to 1:30 waitressing shift and was sitting down to a long awaited three-o’clock-ish dinner. That’s when my Father spotted them. A collection of brownish dots on the hillside across the valley. Before you could say Jack Sprat, I was Carhartt clad and in the valley, easing our trusty Chevy to a soundless stop several hundred feet from the trail which led up to cleared fields at the top of the hill. I closed the truck door with the faintest click, and stalked cougar-like up the hill, Winchester 260 in the ready, all five senses doing double duty. Airy flakes of snow blew softly through the air around me, doing their best to diminish the intensity of the moment, and cushioning the sound of my footsteps quite graciously. About halfway up the trail, I noticed several lines of tracks on the ground. Ha, no, I really did know what they were. Stealthily, silently, I snaked my way up that last hill, setting each booted foot down gently as a falling leaf for fear my feet would squeak on the snow. Cresting the top of the last hill, I took an even firmer hold of my rifle and raised it in preparation to aim. Rounding that last corner on toes of air, every muscle tensed, I knew that if I spooked the herd, my chances of felling a deer would evaporate. directly in front of me, was the glossiest, hugest, most UNCONCERNED…..
…flock of turkeys I had ever seen. In my life. My jaw dropped in complete shock. Turkeys? What the baloney! Were these creatures some sort of where-deer, able to change shape at a moment’s notice? Where in the world were the deer? Was this a plot? WILD TURKEYS are not supposed to allow a human to sneak up this close to them. These deranged creatures were literally only 70 feet away. Rewind back to my little hunter safety class. One night we had studied turkeys. All about turkeys. 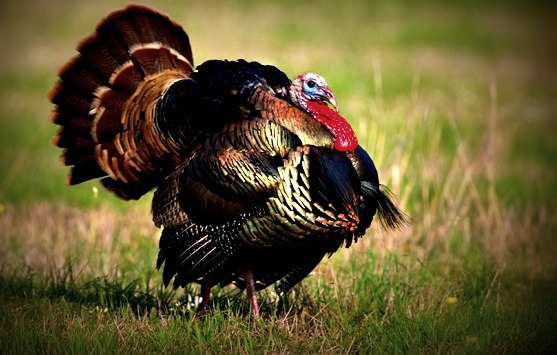 We studied the colors of turkeys and the life habits of turkeys and the feeding cycle of turkeys and what you should avoid wearing in the woods so that other hunters would not mistake you for a turkey. It was quite overwhelming. But one thing amazed me. And that was the fact that turkeys have AMAZING senses of both vision and hearing. Just by turning their necks, they can gain a 360-degree field of vision. They can hear sounds that are made up to a mile away. Whew. When I’m wearing a hat, I can’t even hear someone in the same room. I thought of all of this as I stared at the still-oblivious flock in front of me. What kind of unrighteous turkeys were these? Why in the world hadn’t they heard me coming? I wasn’t sure if I should be terribly proud of myself for stalking them so surreptitiously, or if I should feel utterly ridiculous for sneaking up on the wrong creature. I mean, the tracks were KIND of a big hint. 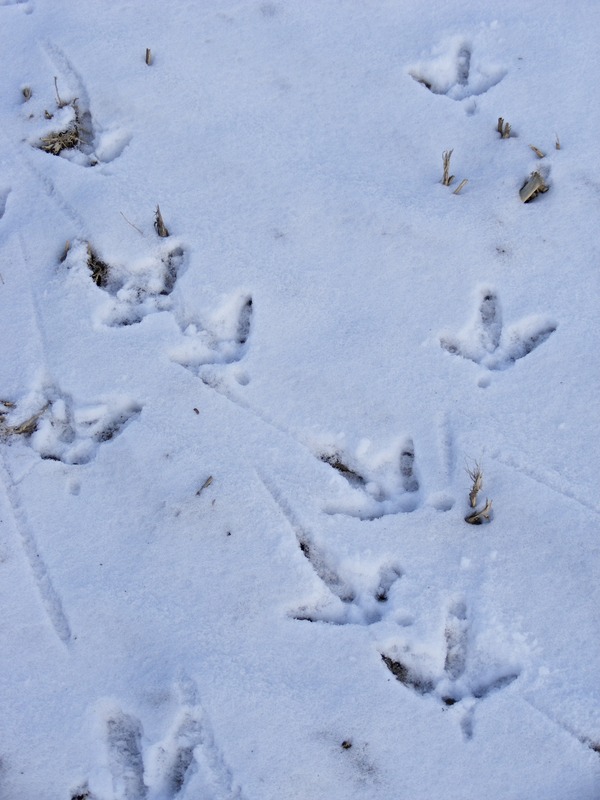 I said “BOO!” to the turkeys and watched them squawk and fly, and then turned and trudged back down the hill, laughing to myself as my boot tracks over-marked the hundreds of turkey tracks on the trail. I guess it just goes to show that what my Great-Aunt Thelhaminda always said is true. Over-confidence killed the cat. Well, actually I just made that up. And I never had a Great-Aunt Thelhaminda. But if she had existed, I think she would have had a point….. I LOVE this blog. It made my day. God has given you such a gift for retaining knowlege of His creation and writing it in such a creative way. 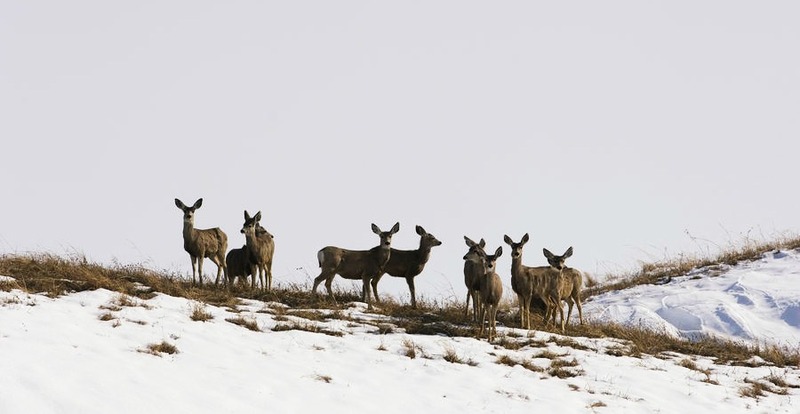 I just had to comment and tell you that picture of deer you have…..those are mule deer. But hey, at least they aren’t turkeys! Haha, thanks Gabe. Point well made 🙂 I actually did know those are mule deer, my apologies! I really shouldn’t have underestimated the expertise of my readers. Glad to know not all hunters are as clueless as me! Nicely wrtten. Not all things are as they first appear. I wonder who it was who sent you on the wild goose (wild turkey) chase? Good job, Kara, of stalking and writing. Love your take on life.